China's Growing Military Muscle: A Looming Threat? Beijing has long argued its army is primarily defensive, and Chinese senior officers insist the country is decades behind the U.S. But the speed of China's military development is unnerving its neighbors and the United States. 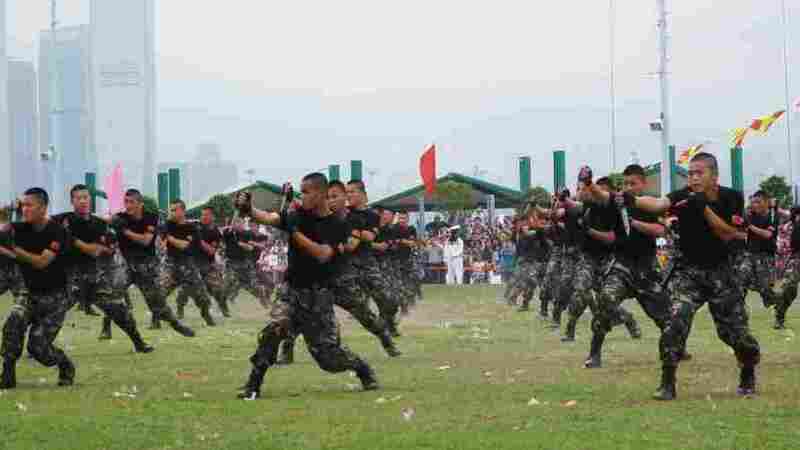 At the Stonecutters Island army base in Hong Kong, camouflage-clad Chinese soldiers lunge forward with fierce yells, making stabbing motions with their daggers. There's a communal shout of admiration from the crowd watching the display on the army's home territory, which is opened up once a year to the public as a goodwill gesture. China is pouring money into its military forces — retrofitting ships, building stealth airplanes and developing advanced weapons technology. Below are three examples of the new face of China's military. 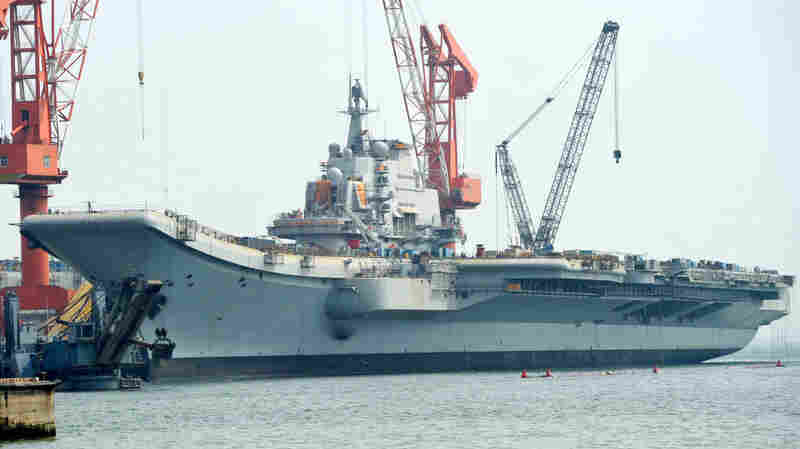 The Varyag aircraft carrier, shown April 26, is being renovated at a shipyard in the northern Chinese city of Dalian. After years of refurbishing work, the carrier — bought from Ukraine — has been described as "on the verge of setting out" by Xinhua state news agency. A J-20 stealth fighter is inspected by Chinese air force ground crew members in Chengdu on April 17. 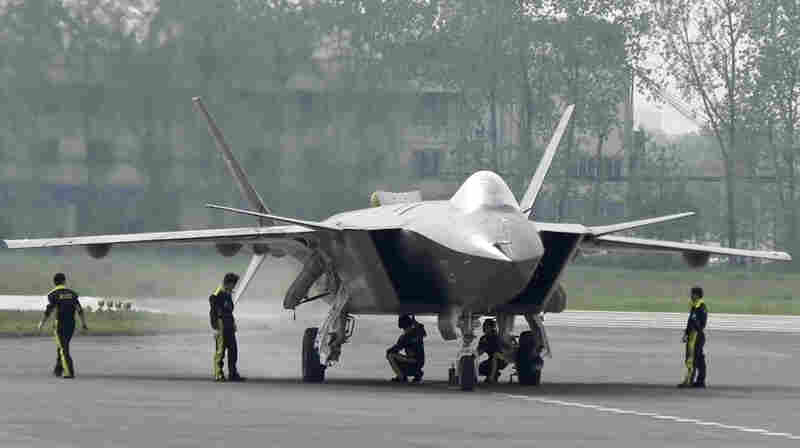 China performed the first test flight of the J-20 during a visit by U.S. Defense Secretary Robert Gates in January. "We've done a lot of work on our image in Hong Kong," says sailor Yu Bin, as he helps visitors clamber up onto a warship. "I don't think people should be scared, because after all, we're here to defend the country." Beijing has long argued its army is primarily defensive, aimed at safeguarding China's territorial sovereignty. But the speed of China's military development is unnerving its neighbors and the United States. Senior Chinese officers insist China's People's Liberation Army, or PLA, is decades behind the U.S. Army, thus justifying 20 years of almost continuous double-digit hikes to the military budget. Many Chinese agree, like Lai Pau Mok, who is enjoying the military parade. "Compared to U.S.A, there's still a long way [to go]," he says. Like many other Chinese, he believes a strong army is necessary to counterbalance the U.S. "If our army is strong enough, it will be no war. If our army is not strong enough, the war will come up." The End Of 'Hide And Bide'? 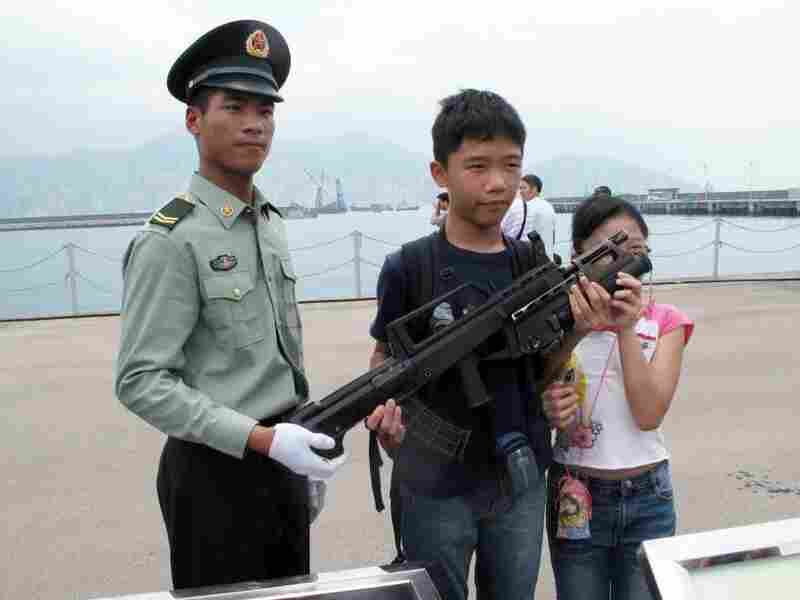 When Hong Kong was returned to Chinese sovereignty in 1997, just eight years after the killings in Tiananmen Square, many Hong Kong residents were unnerved by the Chinese troops rumbling over the border. But now the situation is very different. "China's become stronger and stronger. Everybody feels proud to face to this fact," says another spectator, Teresa Lee, beaming with pride. Indeed, Beijing's new military hardware has caught U.S. defense intelligence off guard, as Defense Secretary Robert Gates openly admitted in January. As if to make that clear, China performed the first test flight of its new J-20 stealth fighter jet during Gates' January visit to Beijing. Now China has almost finished refurbishing its first aircraft carrier — an old Ukrainian model, the Varyag, which the Xinhua news agency has described as "on the verge of setting out." Last week, PLA general Chen Bingde officially confirmed the existence of the carrier for the first time, saying, "The carrier is now being built. It's not completed." "They change Varyag day by day, hour by hour," says Andrei Chang from Kanwa Asian Defense, who's been tracking the work. "We've seen they've installed most of electronic warfare, radio antennas — everything is done." He believes it will mainly be used for training purposes as China prepares to build its own carriers. Chinese aircraft carriers could ultimately change the balance of military power, threatening U.S. power projection in the Pacific. A Chinese survey in May indicated that most Chinese support the aircraft carrier, with 81.3 percent of respondents believing a carrier would "shore up China's overall military power," and 50.9 percent saying it would serve as a counterbalance to the U.S. But Chang says that this is just one weapon in China's arsenal. 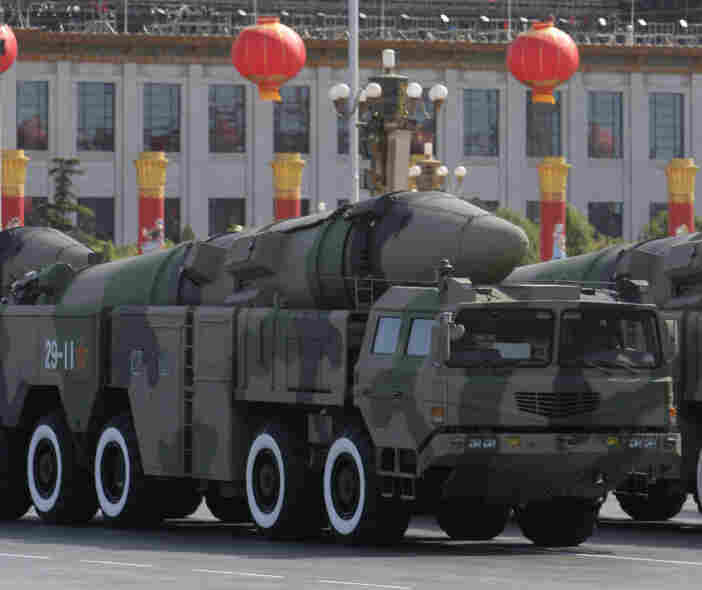 "Compared with Russia and U.S., only China simultaneously is building aircraft carriers, strategic ballistic missile submarines, stealth fighters, nuclear attack submarines, GPS satellite — everything simultaneously," Chang says. Add to that growing nationalism and growing self-confidence. This could mark the end of the era of "hide and bide" — hide your capabilities and bide your time, as advocated by earlier Chinese leaders. Beijing has shown new assertiveness, publicizing military drills and taking a stronger stance in the East and South China seas. China's army bases open their doors every year to try to build their image among Hong Kong's population. Troops pose for pictures and allow children to learn about their weapons. Against a backdrop of rising tensions with Vietnam and the Philippines over the disputed South China Sea, Beijing's been carrying out maritime defense exercises and beach landing drills, as well as dispatching one of its biggest civilian maritime patrol ships to patrol the South China Sea. And the public mood appears to be hardening; despite Beijing's pledges not to use force, one poll found that 82.9 percent of Chinese respondents suggested China should use military actions to resolve its disputes in the South China Sea. But some believe China's military ambitions are nothing new. "China's military dream is to build the strongest country in the world, the No. 1 militaristic power," says Senior Col. Liu Mingfu in an interview posted on the Defence Observer magazine's website. His book, The China Dream, is taught in Chinese military colleges, alongside Carl von Clausewitz's classic On War. But he denies that China's military is a threat. "We are too weak and insecure," says Liu. "The U.S. carries out military drills on our doorstep, and uses its aircraft carriers to flaunt its military power. Every single Chinese can feel the U.S. military threat. U.S. containment and threat are the biggest impetus behind China's military development." Many within the military establishment downplay the idea of a "China threat," asserting that China's aims are not expansionist. "We only want one thing: Don't harm our interests," says retired Maj. Gen. Xu Guangyu. But China's interests are expanding at warp speed, encompassing ever more shipping lanes, oil supply channels and Chinese citizens overseas. "The U.S. must accept the changing situation. As China becomes more powerful, we'll start voicing our opinions about our maritime demands, and any conflicts regarding surrounding territories," he says. He characterizes China's security stance as "active defense," and says Beijing has no intention of opening military bases overseas or replacing the U.S. as a "global policeman." But there are clearly more hawkish voices, which are becoming ever louder in this debate. The Global Times, a nationalistic-leaning tabloid, recently ran an editorial calling for Chinese military bases overseas. "If the world really wants China to take more responsibilities in Asia-Pacific region and around the world, it should allow China to participate in international military co-operations and understand the need of China to set up overseas military bases," said the Global Times. "It will not only make our world safer, but can also protect trade routes from pirates and terrorists. Worrying about China's overseas military activity will only isolate China from the rest of the world." Perhaps hoping to defuse tensions, China recently sent its military band, along with its top generals, to the U.S. In public, the talk was of friendly cooperation. But many fear China's speedy military modernization speaks another language.